Ahoy there me lads and lasses! Yer favorite pirate app is back from another booty hunting adventure and the crew and I were very lucky to take home great finds! We spotted another promising location for our next treasure hunt, but ‘afore we go there, ‘acourse this bucko won’t forget about yer regular dose of app review. ‘Tis about something that I wanted to be when I was a little lad, to become a superhero! Well, although this app is about superhero, it’s more about fashion and makeover, which is different from what I wanted. But listen up ye mateys as I tell ye more about the app. This app is more for girls because the main character is a girl. The setting is an eye candy because it’s sparkling and colorful. There are also various options when it comes to creating the look of your character. You will not get easily bored because of the details on the app. If you have played makeover games before, this one has the same basic gameplay in which you can change the look of your character, including its makeup, hair, accessories, and outfit. Instead of regular outfits, the options are more out of this world. But what sets it apart from other makeover games is its mini games. There are mini games that you can play in between, such as placing the right pictures on the newspaper and another game where you need to avoid the obstacles while flying. While there are many objects that you can use in the game, you only have access on some of them at the start of the game. Many of them requires to be unlocked and you would need to collect more of its currency to unlock them, unless you decide to make an in-app purchase, which will use real money. 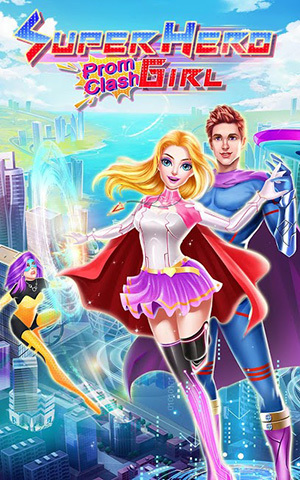 Superhero Girl Prom is free to download and play. It is an eye-candy and it has many options for customizing the look of your character. It also has mini games, which adds fun as you will not just be doing a makeover, but you can also play other games. It is also easy to learn and you will not get easily bored. Although the game can be played for free, you might be tempted to make an in-app purchase that uses real money because many objects or options are still unlocked. The audience of the game may also be limited because it’s a makeover app, which is mostly interesting to kids and girl players. 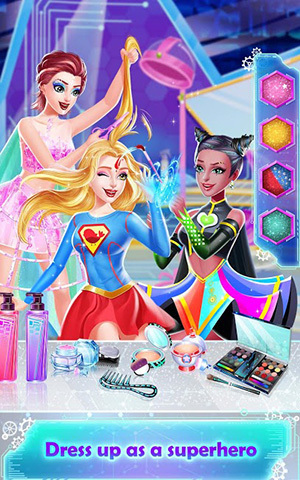 Superhero Girl Prom will interest you if you are into girly and makeover games. Some of the options may be locked, but you can eventually unlock them if you don’t wish to spend real money on your in-app purchase. It’s a casual game that can help you pass time. It doesn’t bring any challenge, but you will not be easily bored.